The links below may be of interest. More links will be added over time, and if you would like to suggest one, please contact TACA. The Royal British Legion (http://www.britishlegion.org.uk) provides financial, social and emotional support to those who have served, and who are currently serving, in the armed forces, and to their dependants. On the Rear Party website (http://www.rearparty.co.uk), an unofficial community site for the friends, families and supporters of the British armed forces, you'll find forums, a photo gallery, live chat and blogs, as well as information, support and advice. The focus of Forces Reunited (https://www.forcesreunited.co.uk) is on the veterans' community. As well as enabling members to make contact with old forces friends online, it hosts forums and chat rooms and displays memories, memorials and images submitted by members. There are a number of groups on Facebook (http://www.facebook.com) that bring together past and present 'army brats'; the largest is currently British Forces brats, which is open to all. In November 2015, My Daddy is a Soldier Adventures relaunched as Little Troopers, which supports all children with a serving parent in the British armed forces. Click here to visit its website, and see below for the charity’s origins. Would you be interested in joining My Daddy is a Soldier Adventures in helping the ‘little troopers at home’? If so, Louise and Linda say that they are ‘always looking for people to run events and workshops for us’, and would also welcome hearing from anyone with a skill, talent or service that would enhance the positive experiences that British army children can enjoy with others in a similar situation through My Daddy is a Soldier Adventures. Her Majesty’s Schools – ‘HMS’ for short – Heroes is a ‘pupil-voice group’ that supports service children and young people. Formed in Plymouth, it is a tri-service group that today has members of pre-, primary- and secondary-school age from all over the country – over 2,800 in November 2012, a figure that is rapidly increasing – who act as young advocates for service families, as their area’s ambassadors and, most importantly, as friends to each other. Here’s some information from HMS Heroes itself about the nature of the group, and about the work done by its members and member schools. ‘HOW DOES HMS HEROES WORK? creating a national HMS Heroes network. HMS Heroes thrives on the creative nature of our members and on support received from many parts of the community. It is a true pupil-voice group. The name comes from a joint decision in your own home: you can be a HMS Hero in supporting the parent left behind when the other goes away, in caring for your brothers and sisters and in being brave when your parent or family member is in a dangerous place. “We are all heroes”, noted one ten year-old, and it became the venture’s name. When we come to the delegates’ group, it is “a safe place to talk because you know your friends will understand how you feel because they feel the same”. We can speak openly about our issues and challenge our schools to respond through the group, rather than having to single ourselves out. Many HMS Heroes experience the trauma brought about by the cycle of service deployment and value support that does not make us feel “different”. 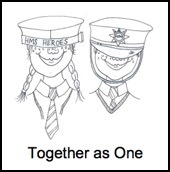 Our motto, “Together as One”, was devised around this theme, by combined agreement, as was our logo (above), drawn by a primary-school member. The key words we use to show the support that we want from HMS Heroes are: strength, hope, trust, care and support. At a recent meeting, some older HMS Heroes reported the difficulty of studying war and conflict, as lessons can trigger intense emotions. “I just have to get out of the room”, said one girl, “my teacher wouldn’t understand”. Issues we have talked through have included responding to our feelings related to the cycle of deployment and the death of a parent in Afghanistan. When three girls, all under eight, lost their dad, HMS Heroes was the first to respond. On the day of the funeral, three HMS Hero representatives attended on behalf of the wider group and proudly carried the HMS Heroes standard amidst those of the Royal British Legion (RBL) and the regiment. The scene was so moving that it provoked letters to the local paper praising our strength in the face of our specific challenges. This was very kind, but we didn't want praise. We support our friends. The group is successful due to the partners supporting us, which include local businesses, the Royal Navy, the army, the Royal Marines, councillors, MPs, the Naval Personal and Family Service, HIVE welfare support, contributing schools and our main supporter: the Royal British Legion, Devon. Talking with people of all ages is a key focus, and we want to make a difference in our communities. We work with faith and community groups, supporting many public occasions; we have a plot in the national garden of remembrance at Royal Wootton Bassett, where we send crosses and a wreath, each year, with our thoughts and feelings written on them; we support the homecomings of our troops and their anniversary events, not to mention Armed Forces’ Day. We hold events for veterans, raise money for service charities and, most of all, we care for each other . . . we are a family: “Together as One”. HMS Heroes has the first children’s standards, matching those of the RBL. These have become the rallying symbols of HMS Heroes, and they have helped engagement with city events and have developed understanding of teamwork. The national standard was dedicated during Armed Forces’ Week in 2012. This now travels the nation to significant events. Each school/pre-school group has developed from a small club into a resource to provide support in the way that best suits each place. HMS Heroes has focused on supporting our families through difficult times, and we are keen to support our partners to achieve their aims, specifically the RBL, for whom we have raised over £2,500 to date in 2012. As service children move on, and as HMS Heroes receives more publicity, schools continue to join it. The volunteer-support team has brought together the adults who support us on a day-to-day basis, and has helped to up-skill them and develop networking, as well as actively linking them with other supporting agencies and each other. Vickie Harrison has sent news of the website that she has co-founded specifically for young children with service-personnel parents or family members who have been deployed or are otherwise working away from home. The aim of Combat Kidz, www.combatkidz.co.uk, is to provide these children with some much-needed distraction while their loved ones are away, and the website therefore suggests things for youngsters to make and send to them, as well as featuring activities like games, competitions and templates for colouring in. Also presented are a combat dictionary explaining abbreviations of military words; cooking and joke corners; a selection of e-cards to send to friends and family; and much more besides. Vickie writes: ‘We want children to know that we are here and that there is support available to them, and we can’t do this without the support of others. We are always in need of competition prizes and raffle donations, but all help is greatly received.’ Click on the link to visit the website: http://www.combatkidz.co.uk. A new charity has just been set up dedicated to supporting children who have lost a parent serving in the British armed forces. The brainchild of army widow Nichola Scott, Nichola was inspired to set up Scotty's Little Children following the death in Afghanistan of her husband, Corporal Lee Scott (known as 'Scotty'), leaving behind a young son, Kai (who he used to call his 'little soldier'), and daughter, Brooke. The charity's aim is to bring the occasional ray of sunshine into the everyday lives of bereaved forces children by providing them with treats, activities and outings. 'We know that a birthday gift, trip to a theme park or visit to a zoo won't take their grief away,' say those running Scotty's Little Children, 'but if we can offer a brief respite to these brave children coming to terms with their loss, we believe our efforts won’t have been in vain'. To read more about Scotty's Little Soldiers, and to find out about the ways in which you can support this new charity, visit its website: http://www.scottyslittlesoldiers.co.uk. Scroll down to the bottom of the following pages for more lists of links. > For links relating to army children's transportation, see 'ON THE MOVE'. > For links regarding the places where army children have lived, see 'POSTINGS'. > For links concerning army children's education, see 'SCHOOLING'. > For links leading to further information on aspects of army children's healthcare and the British military hospitals (BMHs) where many were born, see 'HEALTHCARE & HOSPITALS'. > For links relating to genealogical research into specific army children, see 'HISTORY MATTERS'. > For links to researchers into current and recent army children, see ‘CURRENT & RECENT RESEARCH’. > For links that provide historical background information regarding many army children's lives and times, see 'HISTORY MATTERS'. The following publications all help to put the history, lives and times of the children of serving British soldiers into context in some way. Can you recommend any other titles that you feel may merit a place on the list? If so, then please e-mail details to TACA. Brennan, Jennifer, Curries & Bugles: A Memoir & Cookbook of the British Raj, Periplus Editions (HK) Ltd, Boston, 2000. Chandler, David (ed), The Oxford Illustrated History of the British Army, Oxford University Press, Oxford, 1994. Cockerill, A W, The Charity of Mars, Black Cat Press, Cobourg, Ontario, Canada, 2002. Cockerill, A W, Sons of the Brave, Leo Cooper in association with Secker & Warburg, London, 1984. Forty, George and Anne, They Also Served: A Pictorial Anthology of Camp Followers Through the Ages, Midas Books, Spelhurst, 1979. Freeman, Bob, The Soldier Boy, George Mann Books, Maidstone, 1996. French, Paul, BAOR Boarding School 1948–1959, PNS Publishing, Andover, 2014. Gibson, Clare, 'Children of the Regiment', Practical Family History, March 2007. Gibson, Clare, 'Minors on the March', Ancestors, September 2008. Gibson, Clare, 'Following the Drum', Family History Monthly, September 2009. Gibson, Clare, ‘Married Quarters: Then and Now’, AFF Families Journal, Winter 2009. Gibson, Clare, 'A Poignant Story from Postcards', Family Tree magazine, September 2010. Gibson, Clare, Army Childhood: British Army Children’s Lives and Times, Shire Publications Ltd, Oxford, 2012. Gibson, Marianne, How the Army Wife Gained Status and a Voice in 1982, Canterbury, 2002. Holmes, Richard, Redcoat: The British Soldier in the Age of Horse and Musket, HarperCollins Publishers, London, 2001. Holmes, Richard, Sahib: The British Soldier in India, 1750-1914, HarperCollins Publishers, London, 2005. Hurl-Eamon, Jennine, Marriage and the British Army in the Long Eighteenth Century: 'The Girl I Left Behind Me', Oxford University Press, Oxford, 2014. Jessup, Chris, Breaking Ranks: Social Change in Military Communities, Brassey's (UK) Ltd, London, 1996. Jolly, Ruth, Military Man, Family Man, Crown Property? Second Edition, Brassey's, London, 1992. Longyear, Michael (ed), A New Life: Some Pupils' Accounts of the First Full Year in the Life of Prince Rupert School, Germany, 2007. Longyear, Michael (ed), Prince Rupert School: The Creation of a Boarding School for Service Families in Post-war Germany, 2006. May, Trevor, Military Barracks, Shire Publications Ltd, Princes Risborough, 2002. Mays, Spike, The Band Rats, Peter Davies, London, 1975. McGuffie, Tom Henderson, Rank and File: The Common Soldier at Peace and War, 1642-1914, Hutchinson, London, 1964. Neuburg, Victor, Gone for a Soldier: A History of Life in the British Ranks from 1642, Cassell Publishers Ltd, London, 1989. Parker, Tony, Soldier, Soldier, William Heinemann Ltd, London, 1985. Stanford, Fiona, Don’t Say Goodbye: Our Heroes and the Families They Leave Behind, Hodder & Stoughton Ltd, London, 2011. Trustram, Myna, Women of the Regiment: Marriage and the Victorian Army, Cambridge University Press, Cambridge, 1984. Vassallo, Colonel David, Who was Sapper Brown? Remembering British Military Burials in Cyprus, David Vassallo, 2014. Venning, Annabel, Following the Drum: The Lives of Army Wives and Daughters Past and Present, Headline Book Publishing, London, 2005. Wayper, Leslie, Mars and Minerva: A History of Army Education, Royal Army Educational Corps Association, 2004. White, A C T, The Story of Army Education, 1643-1963, Harrap, London, 1963. Williams, Noel St John, Judy O'Grady & the Colonel's Lady: The Army Wife and Camp Follower Since 1660, Brassey's Defence Publishers Ltd, London, 1988. Williams, Col N T St John, Tommy Atkins' Children, HMSO, London, 1971. 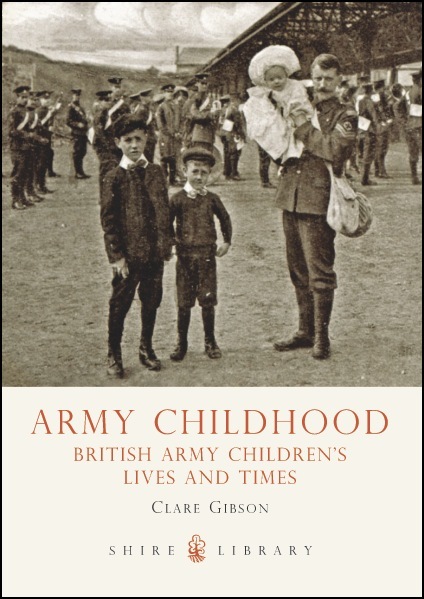 A book by The Army Children Archive’s founder, Clare Gibson, was published in May 2012. With an extent of fifty-six pages, Army Childhood: British Army Children’s Lives and Times may be short – in fact, it’s the perfect fit for a jacket pocket or handbag – but it is illustrated with seventy fascinating illustrations and is furthermore packed with information about the lives and times of army brats since the establishment of Britain’s standing army to the present day. Starting with an overview of what makes the army-child experience different from that of children brought up on civvy street, Army Childhood’s six chapters outline how army children have been viewed and catered for by the military authorities over the centuries; where they have lived in the world, and how they have travelled there; how pads brats have been accommodated; the nature of life ‘within the wire’ for barrack rats; the types of schools that army children have attended; and how they have spent their leisure time. The book ends with a consideration of the legacy of an army childhood – how does it leave its mark? Dedicated to all British children, past and present, if you have found the TACA website interesting, you’ll be captivated by the unique insight presented by Army Childhood. Army Childhood: British Army Children’s Lives and Times, by Clare Gibson, was published in May 2012 by Shire Publications Ltd. Click here for further details and to order it directly from Shire. A W Cockerill, who runs the Delta Tech Systems website (a mine of information on army education and, in conjunction with http://www.rma-searcher.co.uk, the Duke of York’s School and the Royal Hibernian School), has sent news of a new book entitled A New History of the Royal Hibernian Military School, by Howard R Clarke. 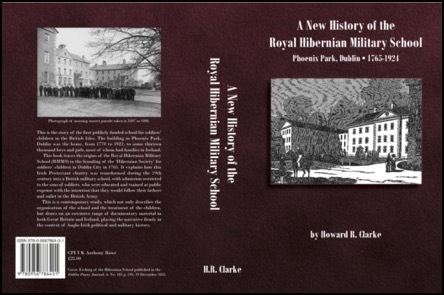 ‘This history of the Royal Hibernian Military School and its buildings in Phoenix Park, Dublin, traces the school’s origins to the foundation of the Hibernian Society for Soldiers’ Children (boys and girls) in the parish of St Paul, Dublin, in 1765. Howard Clarke explains how, in the nineteenth century, at a time when Irishmen formed a large part of the British Army, the school was transformed into a military school, for the sons of soldiers only, with the objective of preparing them to follow their fathers and enlist in the British Army. The Hibernian School was opened at Phoenix Park in 1770, and was evacuated to England in 1922. During these years, the buildings were home to more than 13,000 boys and girls, most of whom had family connections in Ireland. Readers with ancestors who attended the school will be interested in the living conditions of the Hibernian School children. The book describes their food, discipline and the education that they were given to prepare them for indentured apprenticeships – or, from 1808 in the case of the boys, for enlistment in the British Army. Howard Clarke’s well-researched and -referenced history includes 44 black-and-white and colour illustrations, maps, a bibliography, and an introduction written to assist the reader to identify chapters relevant to his or her particular interests. This book deserves a place in any library or military collection, and will be welcomed as a source of genealogical reference for more than an estimated 2 million descendants of the Hibernian School students. Format: 561pp. Demi 8vo, paperback. Weight 1kg. Price £26 ($45.00 US), including handling and shipping by surface mail. Available through PayPal from Howard R Clarke (e-mail clarkehr@aol.com). Peter Anderson, whose father was in the Royal Army Pay Corps (and who is the poser of a question on TACA that resonates with many army children: 'QUESTION: WHERE IS MY HOME'? ), has sent news of a book that he has recently published. Called Poppies from the Heart of Strathspey, the book explores the effect that World War I had on Strathspey, in Morayshire, Scotland: on its men, who fought in the conflict, and on the families and communities that they left behind. Click here to read a review of Peter's book. Those who are interested in understanding what it was like to grow up as a British army child in pre-independence India, those who actually did so, and anyone who savours Indian and Anglo–Indian food will relish Jennifer Brennan's book Curries & Bugles: A Memoir & Cookbook of the British Raj (for further details, see: http://www.amazon.co.uk/Curries-Bugles-Memoir-Cook-British/dp/9625938184/ref=sr_1_1?ie=UTF8&s=books&qid=1221088275&sr=8-1). Despite her mother's family having lived in India since the days of the East India Company, this 'third-generation member of the British Raj' and daughter of an officer in the Royal Engineers (then a captain, later Major-General G A T Pritchard, CBE), was born in Aldershot in 1935 ('My parents decided . . . that I should be born in England and so I was'). The family soon returned to India, however, and this fascinating book – part memoir, part colonial and social history, part family photograph album and part recipe book – presents an evocative picture of a British army family's privileged lifestyle in India during the 1930s and 1940s. Following his family's arrival on the Mediterranean island of Malta (then a British dependency) in 1937, it seemed to the young Michael Longyear that life was 'one long round of swimming, beach picnics, lunches, sight seeing and generally enjoying ourselves'. The youngest of the five children of a regular soldier in the Royal Engineers, Michael would progress from primary to secondary education during the five years that he spent on Malta, but the idyllic peacetime conditions that he recalls in Malta, 1937-1942: Some Childhood Memories would prevail for only two. 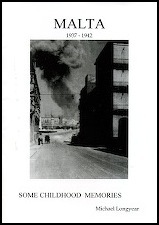 His memories from this pre-war period encompass such details as the appearance of the married quarters at Msida Bastion; attending primary school in Floriana Barracks; accompanying troops on exercise; and enjoying a typical Maltese workers' lunch. Food, or the lack of it, would loom ever larger following the outbreak of World War II in 1939, and particularly between 1940 and 1942, when Malta was attacked and besieged by the Axis powers, Italy and Germany. Initially, 'there was very little activity with only 211 air raids [in 1940], just over one a day, which we as children did not worry about at all', writes Michael, but from 1941, the bombing raids became heavier and more frequent, causing the population to spend increasing amounts of time in air-raid shelters. Food and clothing became ever scarcer, and, as Michael comments, 'To feed, clothe and keep clean a family with no running water, electricity, fuel, food or clothing must have been a nightmare' for his mother. Michael and she would be evacuated to England via Gibraltar by air in 1942, but not before they had witnessed the presentation of the George Cross to the island of Malta. To obtain a copy of this illustrated, 40pp booklet (which costs £4, including post and packing for the UK; overseas p&p by arrangement), e-mail MLPRS@aol.com. When your family is as large as Arthur Fulthorpe’s, life is never going to lack noise and colour, and when a world war demands the active participation of most of your siblings, nor will it be without drama and incident either. Art Cockerill’s novel begins in 1937, the opening chapters of Lay Gently on the Coals painting a nostalgic picture of a close-knit working-class family, at the heart of which are Jack and Margaret Fulthorpe and their seven children (three more will join them in due course). Arthur, nine years old in 1937, is the fifth in line. Jack is working as a stoker at a gasworks in Northampton at this stage in the family’s history, yet the Fulthorpes have a strong sense of military identity. For not only is Northampton a garrison town, but Jack was once a soldier who ‘fought in the trenches of the Western Front and served as a soldier of the British Raj on the North West Frontier’ until leaving the army as a sergeant in 1927. Indeed, it is because they are a ‘military family in need of the army’s charity and benevolence’ that Arthur is admitted to the Duke of York’s Royal Military School in Dover, Kent, in 1939. On the outbreak of World War II, those of Arthur’s siblings who are old enough to join up opt for military service, too, with Jack junior and Harry enlisting in the Royal Navy; Mary, in the Women’s Land Army, and later the Auxiliary Territorial Service; and Ada May, in the Women’s Auxiliary Air Force. Schooling completed, Arthur moves on to the Army Technical School, as does his younger brother Fred, following in Arthur’s footsteps from the Duke of York’s Royal Military School. All survive the war, although not unscathed, and Lay Gently on the Coals recounts the heroism, horror, humour – and surprises – inherent in their wartime experiences, also relating how civilian life on the home front changes during the war years. History-lovers will especially appreciate this book, as well as the author’s lively style and sharp eye for detail. Family and local historians will savour the author’s skilful evocation of the atmosphere of 1930s’ Northampton and his description of the daily lives of working-class families of the time. Those with army ancestors – especially if they served in the Northamptonshire Regiment – and readers with an interest in military history will relish the account of the Talavera Day parade witnessed by a thrilled young Arthur, as well as the ‘military metaphor’ that, as he puts it, is ‘woven into the fabric of our lives’. Past and present Dukies will be drawn to the sections devoted to Arthur’s time at the Duke of York’s Royal Military School, of course, while those without personal experience of a military school’s idiosyncrasies will find them enlightening. Lay Gently on the Coals, by Art Cockerill, was published in 2011 by AESOP Publications, UK. Click here to order the book directly from AESOP Publications or click here to visit the author’s website, which gives further details of the book (http://www.achart.ca/books/lay-gently.htm) and also presents a comprehensive history of the Duke of York’s Royal Military School. 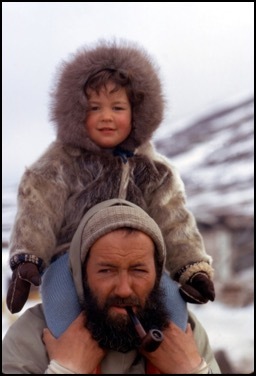 Visitors to TACA may be interested in a new book by Kari Herbert, daughter of the polar explorer and one-time army child Sir Wally Herbert (1934-2007). Heart of the Hero: The Remarkable Women who Inspired the Great Polar Explorers provides a privileged and absorbing insight into the lives and personalities of seven women who supported and inspired an élite brotherhood of polar explorers: Kathleen Scott (wife of Robert Falcon Scott); Jane Franklin and Eleanor Anne Franklin (who were married to John Franklin); Jo Peary (wife of Robert Peary); Emily Shackleton (Ernest Shackleton); Eva Nansen (wife of Fridtjof Nansen); and, of course, Kari’s own mother: Marie Herbert. ‘Like Marie, Wally Herbert had an itinerant childhood. Born in York on October 24, 1934, to a soldier and a country girl, he had been taken to live in Egypt at age three. 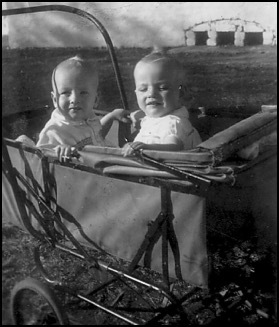 Shortly after the outbreak of the Second World War, Wally, his baby sister, Kath, and his mother, Helen, were evacuated, put ashore in South Africa and told to fend for themselves until the war was over. For the next few years, they lived a strangely dislocated existence. Wally and Kath did not meet their father again until after the war had ended. Wally’s obituary in the Daily Telegraph (13 June 2007) confirms that as ‘the son of an Army officer who had risen through the ranks’, whose father, moreover, claimed that ‘every male on his side of the family since Sir Harry Hotspur had been soldiers’, Wally was under pressure to join up on leaving school, despite his own misgivings: ‘as a teenager Wally had seen all he wanted of mess life: “I would have to talk politely with the CO, dress for dinner and all that. It was a deadly, deadly way of spending your holidays.”’ As it was, Wally himself served in the Royal Engineers from 1953 to 1955, training at the School of Military Survey. Endorsed by fellow famous army child and explorer Sir Ranulph Fiennes as being ‘Fascinating and hugely enjoyable’, Heart of the Hero is an unusual, insightful and rewarding read. Above: Kari Herbert as a small girl perched on her father Wally’s shoulders. Heart of the Hero: The Remarkable Women who Inspired the Great Polar Explorers, by Kari Herbert, was published on 14 February 2013 by Saraband, Glasgow. Visit the publisher’s website for further information: http://www.saraband.net/women/330-heart-of-the-hero. As a Hansestadt – a member of the historically powerful Hanseatic League – the prosperous north German city of Hamburg was built and thrived on trade, its cultural life flourishing commensurately. By 1946, however – Stunde Null (‘Zero Hour’), the bombs and firestorm unleashed by the British RAF and American USSAF had utterly devastated this sophisticated city, now transformed into a frozen, nightmarish world in which a defeated, desperate and traumatised people scrabbled to survive. It was a world disproportionately inhabited, in the immediate aftermath of World War II, by displaced persons (‘DPs’), orphaned and feral Trümmerkinder (‘children of the rubble’) and ‘Tommies’ (as the Germans called the occupying British soldiers). A world in which the victors made black-and-white moral judgments on ordinary Germans, encompassing at one extreme those whose relatively blameless past would eventually deem them worthy of an employment-enabling Persilschein (‘Persil certificate’), through passive fellow-travellers, to unrepentant – and dangerous – Nazi ‘Werwolves’ at the other. It was also a world on entry to which, as British army families were forewarned in the army-issue ‘You are Going to Germany’ booklet, ‘British wives will be looked upon by the Germans as representatives of the British Empire, and on their behaviour and that of the children, far more than of the armed forces, the Germans will judge the British and the British way of life’. It is to this confusing, alien wasteland that army-child Edmund Morgan (‘an eleven-year-old boy living in exciting times’) travels by train and troopship from his Buckinghamshire home at the start of Rhidian Brook’s novel The Aftermath. Part of ‘Operation Reunion’, and accompanied by his mother, Rachel, they are on their way to join Edmund’s war-hero father, Colonel Lewis Morgan, commandant of the Hamburg district of the British Occupied Zone. Here (and most irregularly, given a non-fraternisation diktat), they find that they will be sharing their new home – the Villa Lubert, a ‘bloody great palace’ on the Elbchaussee – with the German family from which it has been requisitioned. The Aftermath is on one level a well-researched novel that deftly describes the day-to-day difficulties faced by occupied and occupiers alike, sketching a grim picture of the starvation, scavenging and black-market deals that prevailed in the chaos that characterised Hamburg during this period. In addition, it is a sensitively written tale of love and redemption in which all of the characters, be they British or German, are treated with equal respect and compassion, leading us to understand that whether combatants or civilians, victors or losers, in the end, no one emerges from war unscathed. 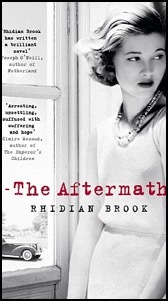 The Aftermath, by Rhidian Brook, was published in 2013 by Viking, London. To learn more about the British School Hamburg, which was located in Altona, during the late 1940s, see ‘TACA CORRESPONDENCE: THE BRITISH SCHOOL HAMBURG, (WEST) GERMANY’, and about the BFES primary school at Stade, today part of the Hamburg Metropolitan Region, in around 1950, see ‘TACA CORRESPONDENCE: BFES PRIMARY SCHOOL AT STADE, (WEST) GERMANY’; to watch a British Pathé newsreel entitled ‘Christmas in Hamburg, 1953’, which includes a shot of children singing a carol conducted by a British army chaplain, click here; and to view a photograph of the NAAFI at Hamburg House, Hamburg, see ‘A GUIDE FOR FAMILIES IN GERMANY, MAY 1954: THE NAAFI’. failed to return or dented under stress. We travelled on. that being us, we were something less than kin. too much of change and chance. Too many things not fully understood. The cuckoo in the nest is flying crooked. © Jenny Argante (née Brice). with easy patterns she found hard to follow. But the location surely was unique? and Mummy was the regimental belle. always more trouble than they’re really worth. of sandals rapid on a shadowy floor. and bite great mouthfuls from her milky glass. and I want to say ‘Hello! why should you? Maybe you’re not allowed. Maybe you’ll come, and think I patronise. I was born in your country, near Bombay. a Signalman, spoke Urdu when he must. for my brown ‘Mama-ji’ when we sailed home. You and your kin came here by invitation. at dirty, ill-paid jobs, and then go back. the promise was null and void from the beginning. the wise benevolence of Mother England? Letter-box arson, street attacks, and hate. To smile and move towards me. I am stuck in my shame and guilt. for all our broken words and shallow laws. If you were an army child who lived in Cyprus during the 1950s, your memories of those days may well comprise a mishmash of mundane scenes drawn from post-war British family life, albeit with a distinctly army flavour (egg-and-cress sandwiches at the mess or officers' club, for instance), played out against a colourful backdrop featuring beautiful beaches, exotic food and friendly Cypriots. Maybe you were there between 1955 and 1959, in which case you may also recall explosions, curfews and feeling fearful, for these were the years when a bloody campaign of terror was waged by members of EOKA, and when British army wives and children were just as much targets as their husbands and fathers. If so, Sadie Jones' latest novel, Small Wars, will transport you straight back to that period of your life. If you have no experience of that time and place, however, their skilful evocation by a prize-winning writer will provide you with a deftly sketched and well-balanced insight into the complex ideals, ideologies and forces ranged against each other in this vicious 'small war' in Cyprus. It will also give you an inkling of the potentially devastating personal effect that the stress of living at the centre of such a volatile situation could have on the servicemen and their families who were stationed in Cyprus, at a time when the term 'post-traumatic stress disorder' was still unknown. Small Wars, by Sadie Jones, was published on 27 August 2009 by Chatto & Windus. Click here to read contributions to TACA from Joan McCartney (PERSONAL STORY: 'I'M JUST SO GLAD I WAS AN ARMY KID') and Sheila Danks (PERSONAL STORY: MY LIFE AS AN ARMY CHILD), both of which recall 1950s' Cyprus from an army child's perspective. ‘When you’ve been brought up on army camps they are all you know, and you live as if in a compound, distanced from the civilian world and all its troubles. The civilian world is not one which is portrayed with any sense of sympathy or realism to an army child. A picture is built up of a destitute place, full of poverty and nihilism. Although this world began at the end of our road, and I spent a lot of my time in it, there was still a sense of fear in my mind about what it would be like. If my childhood was a definition of security, imagine that security being enhanced even more by living in a place where you were surrounded by mates, where all the houses had open doors, and the edges of your world were guarded by soldiers. It made you untouchable. For All Those Left Behind, by John Andrews, was first published in 2002 by Mainstream Publishing, Edinburgh and London. For more about John’s army childhood, see ‘TACA CORRESPONDENCE: THE ARMY PATCH IN BUSHEY, HERTFORDSHIRE’. And click here for John’s blog, Andrews of Arcadia Scrapbook. ‘Looking back, I was always going to join the Army; it just took me a few years to realize it.’ At the start of Red One: A Bomb Disposal Expert on the Front Line, Kevin Ivison, the son of an infantryman, sketches out his army childhood as having been: ‘militarily nomadic, moving from home to home as my father’s Army career led us from my birthplace of Shropshire to York, Germany and finally Lancashire’. His description of the highlights of the five years that the Ivison family spent in Paderborn, (West) Germany (‘on the front line of the Cold War’), will strike a chord with many of his army-child contemporaries: feeling the classroom shake as a column of armoured personnel carriers rumbled by returning from exercise, for instance, or checking under the family car for bombs planted by the Provisional IRA. They will also understand why, after a few years ‘on civvy street’, experiencing an army-awareness day at Fulwood Barracks in Preston inspired the fifteen-year-old Ivison to follow in his father’s footsteps in joining up: ‘I had grown up with the Army and hadn’t even realized how much I had missed it’. ‘The Army felt natural, like family. It was home’, says Ivison, who, between attending Welbeck College and Sandhurst, later became inspired to aim to qualify as an ammunition technical officer (ATO), in other words, a bomb-disposal expert. November 2005 saw Ivison arrive in Al Amarah, the ‘front line’ in Iraq, at the start of his posting as the ATO there. And it was in Al Amarah, on 28 February 2006, that, by now exhausted and with his nerves shot to shreds, he walked past the bodies of two Paratrooper friends on his way to defuse a secondary improvised explosive device (IED). Ivison was awarded the George Medal (GM) for his actions that day, but was left with such severe post-traumatic stress disorder (PTSD) that, three years later, and with a heavy heart, he felt that he had no choice but to leave the army. 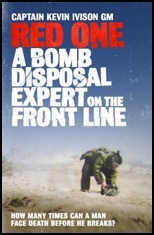 Red One: A Bomb Disposal Expert on the Front Line, by Captain Kevin Ivison, GM, was published in 2010 by Weidenfeld & Nicolson, London. The dedications at the start of Don’t Say Goodbye: Our Heroes and the Families They Leave Behind are telling, listing as they do the names of seven men from the Welsh Guards who were killed in action in Afghanistan in 2009 above those of the author’s husband and children. For the author, Fiona Stanford, the wife of a serving officer in the Welsh Guards and the mother of two army children, wrote her book as an emotional response to the deaths of those seven men. ‘It was at the funerals in the summer of 2009, when I was confronted with the ultimate price paid by the Welsh Guardsmen who died and by the grief of their families, that I understood that writing this book was not just a good idea, it was a necessity. I want to tell the story of the people left behind . . .’ she explains, before drawing on her own experience, and that of other Welsh Guards’ families, to do exactly that. Don’t Say Goodbye: Our Heroes and the Families They Leave Behind focuses especially on army wives, and on the impact that the undeniably family-unfriendly military lifestyle has on them. More positively, it describes the camaraderie and mutual-support network that enables those who married into the army to cope with umpteen moves, disrupted careers and all too regular enforced separations from their husbands, children and extended family. The ‘Nomadic Children’ chapter is, however, devoted to army children, and explains with clear-sighted empathy the distress experienced by youngsters when their fathers are not only absent from home for long periods, but are also deployed to war zones and are therefore exposed to extreme danger. It additionally sets out the problems and difficult choices that are part and parcel of ‘normal’ army life, such as those that arise from moving home and switching schools so frequently. Although it is not a choice made by all forces families, the Stanfords opted to minimise the disruption to their children’s education by sending them to boarding school. As fourteen-year-old Oliver states: ‘I had ten moves and five schools by the time I was eleven, so I was busy. (I did “The Tudors” five times)’, while eleven-year-old Annabel observes that, ultimately, home is ‘where my family is and my own bed’. Their mother later shares her hopes for them: ‘I hope they will reflect and realise that, despite the upheavals and the many goodbyes, they will also have learned from having to be adaptable, self-confident and loyal to friends both old and new’. 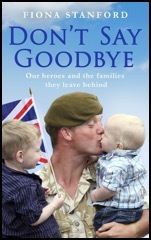 Don’t Say Goodbye: Our Heroes and the Families They Leave Behind, by Fiona Stanford, was published in 2011 by Hodder & Stoughton Ltd, London. Proceeds raised from the sale of the book will be donated to the Welsh Guards Afghanistan Appeal. For more information, visit the publisher’s website: http://bit.ly/dSanf0. An ‘army brat’ and an alumnus of the Duke of York’s Royal Military School, Chris Crowcroft is a generous supporter of TACA whose contribution to the archive makes fascinating reading: ‘PERSONAL STORY: 'IT SURPRISES LISTENERS WHEN I SAY THAT I WAS AN ARMY BRAT'. 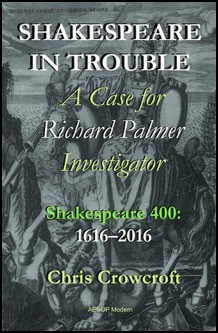 In 2015, Chris’s gripping historical thriller, Shakespeare in Trouble: A Case for Richard Palmer, Investigator, was published to considerable acclaim by AESOP Modern. Hot off the presses now comes Fire, Burn! 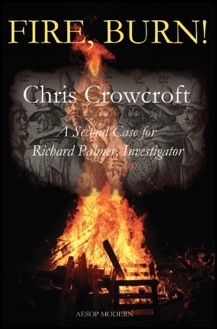 A Second Case for Richard Palmer, Investigator, which is sure to receive equally enthusiastic plaudits. ‘Richard Palmer is an investigator from the 1600s, employed whenever the playhouse and politics collide, which they often did. The events on which his cases are built – two so far: Shakespeare in Trouble (2015) and Fire, Burn! (2016), published by Aesop Modern – are true, while allowing Palmer, a fictional creation, scope for manoeuvre. In the first, it is the aftermath, in 1601, of the attempted coup by two leaders of the nobility in the declining years of Queen Elizabeth. The insurgents have commissioned Shakespeare’s acting company to resurrect an old play, Richard II, to get the mob in the mood for regicide. Will Shakespeare pay the price? Why didn’t he? The second deals with the notorious Gunpowder Plot of 1605, when the playwright Ben Jonson was a dining pal of the plotters, who gathered around Shakespeare’s hometown, Stratford. Factually true. Palmer’s own background reflects the political and religious fault lines of the era. He is fast falling down the social scale, in part because his father squandered his inheritance by refusing to forsake the old Catholic faith for the new Protestant one. Palmer has tried the law – without enthusiasm – and soldiering – more successfully. Now he is reduced to being classed as an informer; “investigator” is the word he prefers. In dealing with the playhouses and the players, he is no luvvie, nor is he a philistine because he was once classically educated. So he hates the “modern” drama, with its breach of classical principles and the “ill-educated hacks who write it”. I came to the period, like most people, through Shakespeare in (in my case, military) school, and, like Ben Jonson, I love him “this side of idolatry”. We had one advantage. The teacher, Chas Connell, a former intelligence officer and successful author, believed in teaching us Macbeth by acting it – repeatedly, in a space cleared in the classroom. I played every role except Lady Macbeth! We were typical army brats, entered into the Duke of York’s Royal Military School, Dover, because our fathers were NCOs – mine was a bandmaster – serving all over empire, where schooling was not always available, or regular school-switching endemic. Since soldiering and the military environment have not changed so much over the centuries, Palmer’s military heritage is still recognisable today. At university in Oxford, I fell into the private orbit of the great historian A L Rowse, just as he was discovering who was probably the dark lady of Shakespeare’s sonnets, reflected in his early plays – the affair didn’t end well. I have been very happy to borrow her, with a twist. After teaching in Verona (sometimes called the “city of Romeo & Juliet”), my career went into the business side of the arts, which embraced, more than once, the Royal Shakespeare Company and Stratford. In recent years, I served a term as trustee for the Friends of Shakespeare’s Church, which is Holy Trinity, in Stratford, where he lies buried. We stopped the roof from falling in on his head with the help of BBC correspondent Nick Higham. We wish Chris every success with his intriguing Richard Palmer series, which promises to go from strength to strength. CHILDREN’S BOOK: WHY DO WE HAVE TO MOVE? Frequently moving house may be part and parcel of the lives of most forces families, but it can be hard to explain to young children why they have to be uprooted from all that is familiar to them. As Joy O’Neill, founder of the Service Children Support Network (SCSN), and herself a service wife and mother, says, ‘Moving home can be hard for any child, but for children whose parents are in the military, it can become a regular and unsettling occurrence’. Joy has therefore teamed up with illustrator Lisa Southard to create Why Do We Have to Move?, a book that is intended to provide support for any child who is worried about the prospect of moving home. Aimed at younger children, the story follows a girl called Grace, who is horrified when she learns about her mother’s new military posting and realises that she will have to leave her home, school, friends and current life behind; the book focuses on how she feels, what she does, and how her father helps her to come to terms with the move. 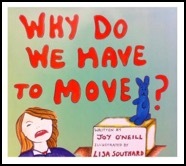 Why Do We Have to Move?, by Joy O’Neill and Lisa Southard, is 32 pages long and was published at the start of 2013 by Authors Online Ltd. Many of TACA's contributors and visitors have had personal experience of the bewilderment and distress felt by very young army children as a result of a soldier parent's prolonged absence, and will therefore empathise with the youngsters who find themselves in a similar situation today. And if any number among your friends and family, you'll be interested to hear of the recent publication of Soldier Oli, by Kirsty Marvell, a rhyming picture book for pre-school children. For Soldier Oli, as Kirsty explains, is the story of a soldier leaving his family to go away on tour with his regiment, and then of his joyous return. It has been written to help children understand and cope if someone in their family has to go away on tour, too. Although written for children from army families, the story and pictures can be enjoyed by all children, Kirsty adds. 'Three years ago, my husband and I moved with his regiment from London to Paderborn in Germany. I gave up work as a PE teacher at this time as I was heavily pregnant with my first child. Nine months after our son was born, my husband went on a seven-month tour to Iraq, along with most of the other soldiers living on our street. Our son was too young at the time to realise that his daddy was going away for such a long time, but it made me realise how difficult it must be for families with older children. I decided to write my story about Soldier Oli to help children understand that although someone in their family may go away on tour, they are still thinking about them and they will eventually come back home. I also thought it important for young children from army families, who may well have soldiers as role models, to have a book where a soldier is the main character. My story was put on hold with the arrival of my second child and our move to Wiltshire. However, many edits later, I finally published the story on March 31st this year . If you know a young army child, you'll be interested in a pair of books specifically for children between two and six years of age. 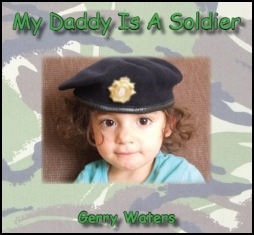 Written by Gerry Waters – herself once an army child, and the mother and now the grandmother of army children – and inspired by her granddaughter Shay (who is pictured on the cover), My Daddy Is A Soldier is intended to help small army children cope with their fathers' absence when they are deployed on operations. As Gerry explains, 'The book My Daddy Is A Soldier isn't just aimed at the immediate Army community, but at the wider British public, as it will help raise awareness of Forces families and the pain of separation. It's also an educational tool for parents; a way of helping children understand that daddy will be coming back.' Following the same template, the main character in My Mummy Is A Soldier tells the story of her soldier mother, who is deployed on operations with the British Army. For more information about the books, visit the My Daddy Is A Soldier and the My Mummy Is A Soldier websites (http://mydaddyisasoldier.co.uk and http://www.mymummyisasoldier.co.uk), from which you can also buy copies for £5.99 each (including UK postage), with all proceeds going to the Afghan Appeal Fund (http://afghanappealfund.org.uk). CHILDREN'S BOOK: MY DADDY'S GOING AWAY . . .
Current forces families will be heartened to learn of the recent publication of an illustrated storybook for young children intended to make it easier for them to cope emotionally when they are temporarily separated from their father. The story of My Daddy's Going Away . . ., by Major Christopher MacGregor – a serving army officer and father of two young children who spent much of 2007 training for and fighting on military operations abroad – is told in fourteen stanzas of poetry, with each verse linking into the emotional cycle of deployment. As well as having personal experience of being separated from his own children, Major MacGregor also has a psychology degree, making him well qualified to understand the issues and stresses faced by children and their fathers when they are apart from one another for extended periods of time, be it due to a military deployment or any other job that takes a parent away from home. 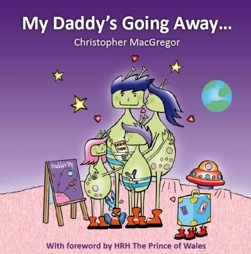 HRH The Prince of Wales has written the foreword to My Daddy's Going Away . . ., which he commends for its potential to 'strengthen bonds and develop coping strategies', as well as for its promotion of Combat Stress and the Foundation for Integrated Health. You can have a quick look inside the book, which is published by Giddy Mangoes, by visiting www.mydaddysgoing away.com, where it is also on sale for £5.99 (including postage and packaging). The website provides useful psychological background information, too, along with advice for preparing for paternal separation before a father goes away, dealing with it during his absence and adjusting as a family after his return. In addition, it gives some top tips and fun ideas for keeping in contact and remaining close as a family whenever a daddy goes away. The Little Book of Heroes, a book published in 2010, is filled with stories and poems written by British forces children and teenagers at Service Children’s Education (SCE) schools around the world, who were inspired to enter a creative-writing competition by its 'my hero' theme. Published by Grosvenor House Publishing Ltd (GHP), The Little Book of Heroes has been endorsed by Simon Weston and is supported by The Sun (to read an article in the newspaper about the book, click here).